As each year goes by more and more events pop up in the towns and villages around Malaga in order to celebrate the local food and gastronomy. 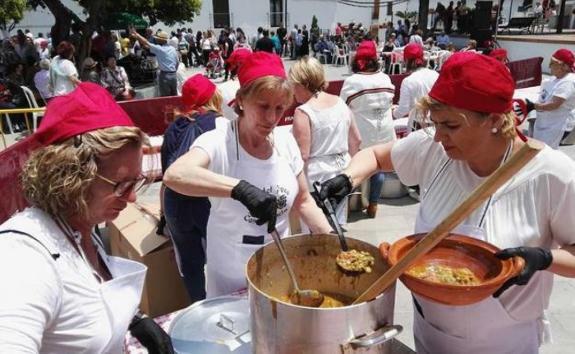 April is a popular month for festivals that celebrate food with the first kicking off in the Hoya de Málaga valley town of Casarabonela to celebrate the Día del Pipeo. Pipeo is curious stew-like dish typical of the Sierra de las Nieves made with onion, artichoke, asparagus, garlic and lettuce. This year's celebration started of well again! On the same day, Istán near to Marbella holds a festival to celebrate the orange with hundreds of glasses of juice given out to visitors. Besides orange dishes, there will be plenty of other local products on offer and cooking classes followed by tastings. Each year, the 6th and 7th of April is also the perfect time to visit Casabermeja when all the bars and restaurants put on menus that celebrate spring produce. A week later on the 13th and 14th of April, Casares holds a festival to showcase its local dishes with competitions, tastings and a food market. Even the humble broad bean gets in on the act with Villanueva del Concepción celebrating this versatile vegetable on the 27th April. On the same day in Canillas de Aceituno, the afternoon begins with plenty of cold beer and wine available to accompany one of Spain’s favourite sausages.